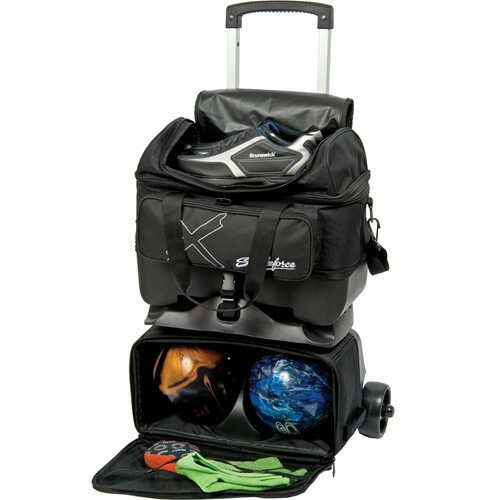 The Hybrid X 4 Ball Roller from KR Strikeforce is a value priced and versatile bowling bag. Not only can you easily carry 4 balls, shoes, and accessories; but you can remove the top bag to be a fully functioning 2 ball tote. So really you are getting two bags in one. Talk about value! 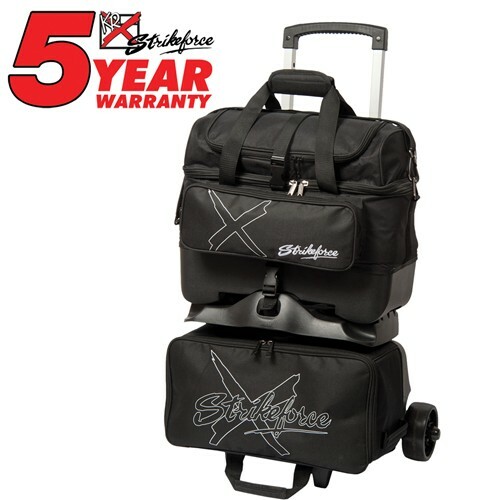 Base: High strength molded plastic Top bag removes to fully function as a 2-ball tote. Bottom bag has an easy access front load design. Large front accessory pocket. Handle: Retractable square locking handle extends to 42.5"
Shoe shelf in top bag holds up to size 15 shoes. What type of dividers does the upper bag have? Hello Richard! The upper bag has fabric and a kind of foam padding dividing the bowling balls. Does top part of bag come off? Hi Jim, yes the top section of the bag is removable. Hello Shar. Yes, these will have bearings. There is a pocket on the lower bag but is it not accessible from the front of the bag. You must open the lower compartment and the pocket is the on the inside of the unzipped front of the bag. Would 2 pair of shoes fit into the shoe compartment one top of each other? Hello! This roller will store up to a size 15 in men's shoes. You can always try to store them that way, but it is not recommended. There will only be 2 wheels. The strap that holds the top bag on came off how do I put it back on? Due to the time it takes to produce the KR Strikeforce Hybrid X 4 Ball Roller ball it will ship in immediately. We cannot ship this ball outside the United States.